Risotto is a comforting bowl of creamy goodness and since it takes only 30 minutes to make? Quick enough for a weeknight meal. Add the chicken stock to a deep pan over medium heat. Mince the shallot and the clove of garlic. In a large fry pan over medium heat, add the olive oil and 1 1/2 tablespoon butter. Heat until hot & bubbly. Add the shallot and sauté for a couple of minutes to soften the shallot. Add the garlic and stir until fragrant, only about 30 seconds. Next Add the rice. Stir the rice to evenly coat all the kernels of rice with the olive oil & butter. Add in the wine and cook until it is nearly all absorbed. Then add two ladlefuls of chicken stock. Cook and stir the rice and only add liquid when most of the liquid has been absorbed and the pan is nearly dry. It will take about 6-7 minutes between each addition and you'll need to continue to stir it while the rice is sautéing. Taste test the rice after about 15 minutes into the cooking process and a couple of times thereafter. You'll want the rice to be tender, but have a bite. It will take about 22 minutes from start to finish. 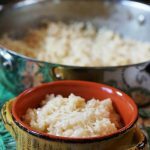 When the rice is tender, remove from heat and stir in the Parmesan cheese and additional 1 1/2 tablespoons of butter. Mix well to combine. Garnish with reserved Parmesan cheese and chives or thinly sliced basil and serve!